The Jio Storm continues! After launching the Jio Preview Offer for Samsung and LG, ASUS and Panasonic and at last they added YU and Micromax yesterday, today we are watching more and more brands getting into the list. There is also the rumor that LYF users will now get one year of unlimited 4G data on Jio, today Jio has announced that Gionee, Karbonn, Lava and Xolo phones will also get the Jio Preview Offer. 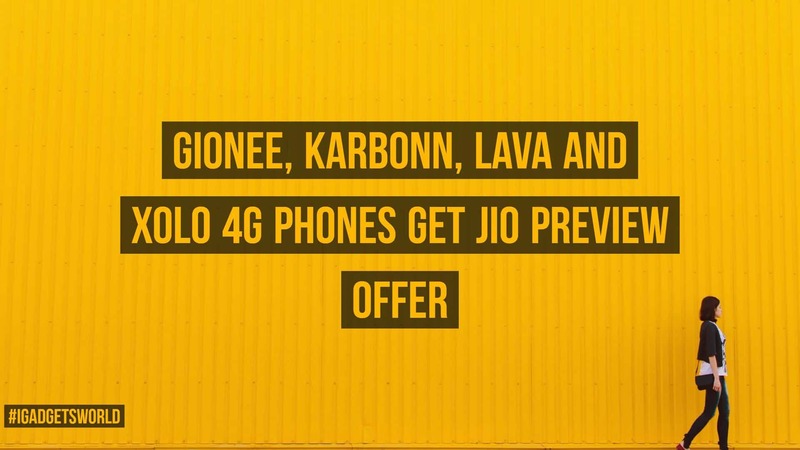 Jio Preview offer is now officially available for all Gionee, Karbon, Lava and Xolo devices which support 4G connectivity. The Jio Preview Offer lets users enjoy free 90 days of unlimited data, calls and messaging for three months. The 12 smartphone brands i.e. Samsung, LG, ASUS, Panasonic, YU, Micromax, TCL, Alcatel, Gionee, Karbonn, Lava, and Xolo are now under the Jio Preview Offer and anyone who has a 4G enabled phone from any one of these brands can get a new Jio SIM card and enjoy the offer. The offer will be available for both new and existing users of all 4G smartphones from Gionee, Karbon, Lava, and Xolo. So, looks like Motorola and Mi are the only well-known brands which are out of the Jio Preview Offer, for now. But there is a lot of chance that they may get added soon. if you are a Motorola or Mi phone user, keep checking us or join us on Facebook to get all the updates regarding the Jio Preview Offer. Next articlePaytm Maha bazaar sale: How to buy all products at 1 Rupee?